Can someone from JetBrains please comment? What are the risks with this? Wow, you can't even log into the OpenJDK Jira to vote on or watch these critical issues. "Everyone with OpenJDK Author status or above has a JBS account which may be used to create and edit bugs. Those without accounts can view bugs anonymously." https://bugs.openjdk.java.net/browse/JDK-8023794 - appears to be under review for Java 9. Jetbrains trying to get Oracle to patch into JDK 8.
https://youtrack.jetbrains.com/issue/IDEA-111466 - appears to have an attempted fix, but not sure that it is working for everyone? https://youtrack.jetbrains.com/issue/IDEA-129634 - Blamed on JVM but no linked OpenJDK issue. https://youtrack.jetbrains.com/issue/IDEA-128481 - Blamed on JVM but no linked OpenJDK issue. https://youtrack.jetbrains.com/issue/IDEA-131767 - Fixed in Java 9, no link to OpenJDK issue. https://youtrack.jetbrains.com/issue/IDEA-127234 - marked duplicate of https://youtrack.jetbrains.com/issue/IDEA-127574 which is an OpenJDK issue that is planned for Java 9. Issue left open even after being marked duplicate. https://youtrack.jetbrains.com/issue/IDEA-131622 - no associated OpenJDK issue, only the advice to use JDK 6. Issue left open. Just downloaded the ultimate 30-trial. I'm running Mac OS X 10.10. Have Java 8 installed. The links to acquire Java 6 referenced in this Known Issue result in blank pages. I'm sure this is a great productivity tool but not so much right now. I look forward to exploring it when it is up and running. Funny thing, http://support.apple.com/kb/DL1572 does not open in Safari but works fine in Firefox. Same problem, for me it was not solved changing the java version in Info.plist. LSOpenURLsWithRole() failed for the application /Applications/IntelliJ IDEA 14.app with error -10810. Not being able to use PyCharm because I don't have an unsupported version of Java installed is lame. What happened to the PyCharm that included the JRE? It was in the later EAP packages. I have the opposite problem. I want to run IDEA on Mac OS X Yosemite (10.10.1), but I need JDK 8 installed for other purposes. So that means I need to install Apple JDK 1.6 (done). But now how do I tell IDEA to use that version of Java? The JVMVersion key in Info.plist is "1.6+" so it continues to use Java 8. Setting the IDEA_JDK variable to /System/Library/Frameworks/JavaVM.framework/Home causes an error dialog about my Java version being obsolete and asking if I'd like to update it. IDEA does not run. If I set the JVMVersion to 1.6* in Info.plist, it runs under Java 6. But that's not a recommended approach, right? So what is? after 1 month of working with Yosemite and get too many issues with Java tools problems like PhpStorm and WebStorm. and even other products i decided to rollback to Mavericks (10.9.5). after rollback all back to work well with 50% memory usage and full development speed i used to work with. except of Java issues, Yosemite has too many small issues that us, developers, encounter all the time. @Cap10morgan I don't see a problem with specifying JVMVersion 1.6*. It works because it limits the JVM to 1.6something, which means the installed Apple JVM. If it works for you, use it. @Pbw One problem, possibly among others, is that–according to JetBrains support–it breaks app updates. They specifically recommend not doing it, so I'm asking, what do they recommend instead? You could download the bundled JDK using the URL http://download-cf.jetbrains.com/idea/ideaIU-14-jdk-bundled.dmg. But remember that you do so at your own risk (it's not supported). My 14 CE EAP version was reporting 222.5 in About. and saying that an upgrade was available to 225. My Info.plist had been set to "1.6*", but I reset it to "1.6+" for this exercise. I downloaded the update, opened the DMG file, and dragged to Applications. "There is an older version..." Replace. I then killed off the IntelliJ 14 process (should have done it first) and then started the app again. Still reporting 222.5. I trashed the app, then re-installed the update I had just downloaded. I had to start it from finder with a right-click, Open, Ok sequence, but it opened Ok and reported 139.225, running on JRE 1.6.0_65. The app Info.plist file has "1.6+" so it seems that you can install Java 8, and IntelliJ 14 CE EAP will run on the Apple 1.60 if it finds it. @Intellij Then what is supported? I want to run a supported Java 1.6 configuration. How can I do that? I hope it gets done (update to Jbefore my trial period runs out. Have subscribed to this post for updates! http://support.apple.com/kb/DL1572 does not open with firefox, chrome, or safari. My phpStorm is not working - and it's not like I can wait to figure this out so resorting to using other IDE. @Nada, we've verified that this link still works fine. If you can't access it for some reason, please try this PhpStorm 8.0.2 build with bundled JDK 8, it doesn't have any external dependencies: http://download.jetbrains.com/webide/PhpStorm-EAP-139.659-custom-jdk-bundled.dmg . nope - the link is not working for me. As everything else is working on the net, I assume it's the site. Will try the bundled link. Thank you. << done. Thank you - the bundled JDK works fine! Modifying Info.plist will break the application digital signature and prevent the patch updates. We do not recommend modifying Info.plist file to run under JDK 1.7 or 1.8. I disagree with that comment. I always modify Info.plist and change 1.6* to 1.8* and am running IntelliJ and PyCharm with success for over an year now. Even CLion (seems to) work fine. Downgrading to 1.6 is not an option as my company's security team has banned obsolete versions from all machines (no exceptions). codesign -f -s - "/Applications/WebStorm.app"
Webstorm won't start, screenshot attached. w/o Webstorm I'm dead in the water @ work tomorrow. Patrick, why do you need to run under a different JDK version? What problems do you have with 1.6? Can you just revert back to the default Info.plist and make sure you have the latest 1.6 JDK update installed on the system? Please submit a support ticket so that our engineers can help you. It would be more convenient and all the users who responded here will not receive the notifications about the updates they may be not interested in. Modifying Info.plist will break application signature, it's expected. We've implemented another way to specify JDK version recently, check this comment. See also this document if you can't find idea.properties file for your product. 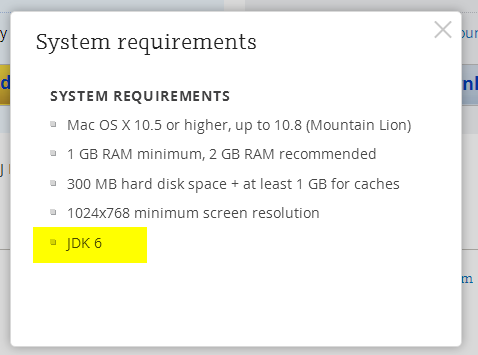 If it still doesn't start, submit a ticket to support, but the recommended solution is to install JDK 1.6. Just upgraded to Yosemite and bumped into this issue. Can someone please clarify: if I downgrade to Java SE 6 using the suggested link (http://support.apple.com/kb/DL1572), does the built-in Java version 1.8 become useless? Is there any way to install Java SE 6 in my home directory and have WebStorm use it, without affecting any of Yosemite's standard setup? I've just done an upgrade to Yosemite (directly to 10.10.1), and I was told that my version of Java was obsolete, and I was directed to the location of the 2014-001 Java6 download. This was in fact already installed. I went ahead and installed it, and then I went to the Oracle JDK 8 download site, downloaded and re-installed JDK 8. I have taken this basic approach on previous occasions when OS X Java6 was updated. For all intents and purposes, JDK 8 is installed, but those applications like IntelliJ which want J6 can find it. I am running into this problem as well. Things used to work fine and now they don't. I am not sure if I changed the OS to Yosemite or grabbed a newer Java but I get the same message about needing the old java. +1 For Vermicida's fix Yosemite, Java 8 "This worked for me: edit the WebStorm Info.plist document, which is located in /Application/WebStorm.app/Content. Replace the value of the key JVMVersion from 1.6* to 1.8*. Save the file and try to start WebStorm again." The EAP version with JDK Bundled will not allow me to Activate my license using my Jet Brains Account. I get this error: "JetProfile connection error: SSLHandshakeException: java.security.cert.CertificationException: java.security.SignatureException: Signature length not correct: got 256 but was expecting 512"
It works fine in Demo mode. I've tried this on my old machine and I had to go through this procedure. Download Java 6, Download PHPStorm 8.02, open once and activate with JetBrains account. After doing this, then I can Activate my EAP version. However on my new machine I'd rather avoid installing Java 6. Is JetBrains aware of the licensing problem with the EAP version? Anyone else have the problem?